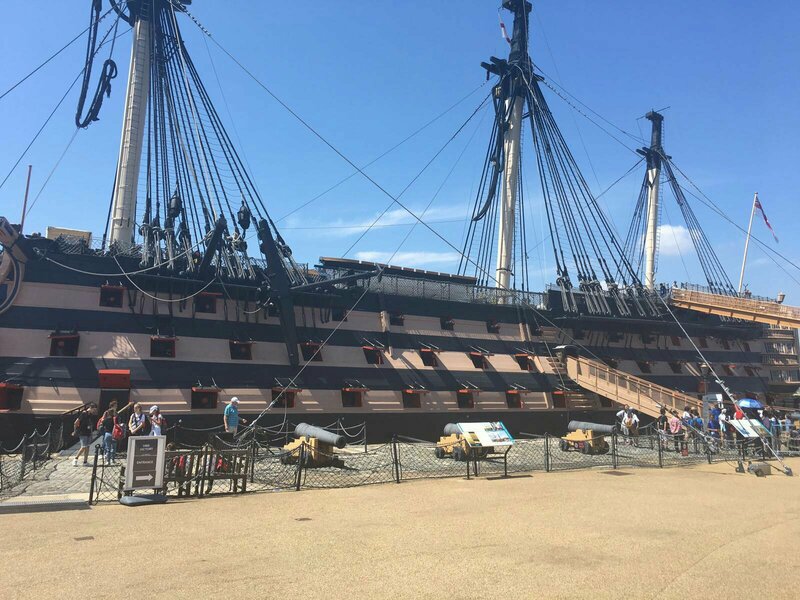 Recently Dan’s dad and his partner came to visit us so we took a trip to Portsmouth Historic Dockyard, our go to day out! I actually worked there for almost 5 years and met Dan while we were both working on HMS Victory (I know, I know, all the nice girls love a sailor 😉) so I will always have a soft spot for it! The Warrior was our first stop, any time we come with visitors they always say the Warrior is their favourite, while I’m firmly in camp Victory, it is a rather lovely ship. 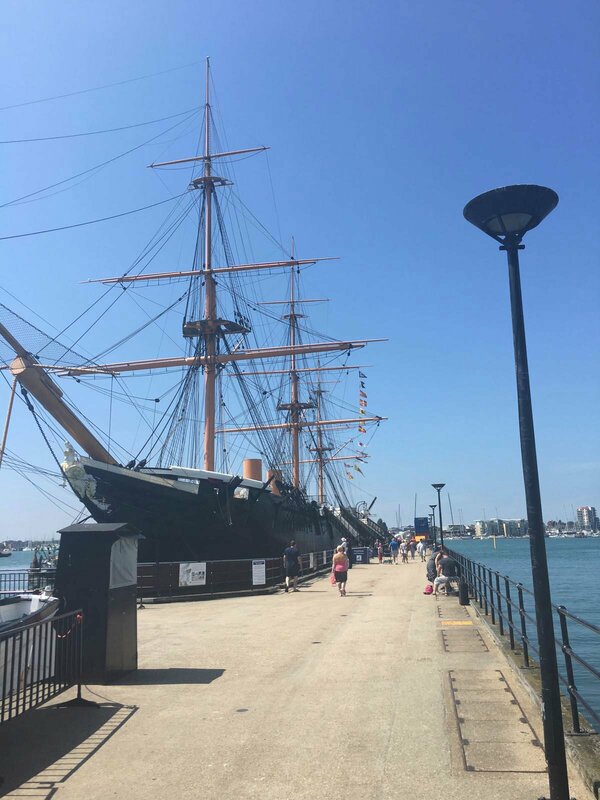 HMS Warrior was launched in 1860 and was the first of its kind, she never saw battle and perhaps doesn’t have quite as interesting a history as the other ships at the dockyard but she certainly looks the smartest! Make sure you get down to the engine room, it is truly impressive! You can also hire it out for weddings (a fact mentioned by Dan himself! Another possible candidate? 😂). We then headed to the Mary Rose as a rather large group of students made their way to HMS Victory! The Mary Rose museum only reopened in recent years now they have stopped spraying the ship and you have a full view of the ship which is amazing. We have been here a few times now but every time we go I spot something new. How they have presented the ship is seriously inspired, you can see a large cross section of the ship and they have lined up their viewing galleries with each deck, its truly awesome. After a quick stop at the NMRN galleries to take a look at the exhibition one of my friends had worked on (women in the Navy if you’re curious, check it out!) we headed over to the real star of the show, HMS Victory. This ship will always mean a lot to me, not only did I find the love of my life there (super cringe, sorry) but it also helped me shape my career path and deep love for heritage and museums. The smell alone as you step on board is so nostalgic to me, delicious old tar and rope! Little history lesson if you need it: HMS Victory is most famous for its role as the British flagship in the Med and role in the Battle of Trafalgar, Admiral Nelson is also most associated with this ship as he died onboard during battle. The day this blog post is going up actually marks 212 years since the battle, so happy Trafalgar Day! It has changed a lot since we worked on there, The Great Cabin where Nelson stayed is looking very smart these days in a beautiful baby blue and visitors can now walk all the way through it which is pretty cool. You can also go up to the Poop deck which hadn’t been open to the public before. Then you go all the way down to the Hold which you can walk all the way around and go through the armoury and carpenters walks that always used to serve as a quick bypass through the visitors when I was there! It gives you a much better insight into the working conditions of the ship as not only is the deck height so restricted but so is the width of these little passages. 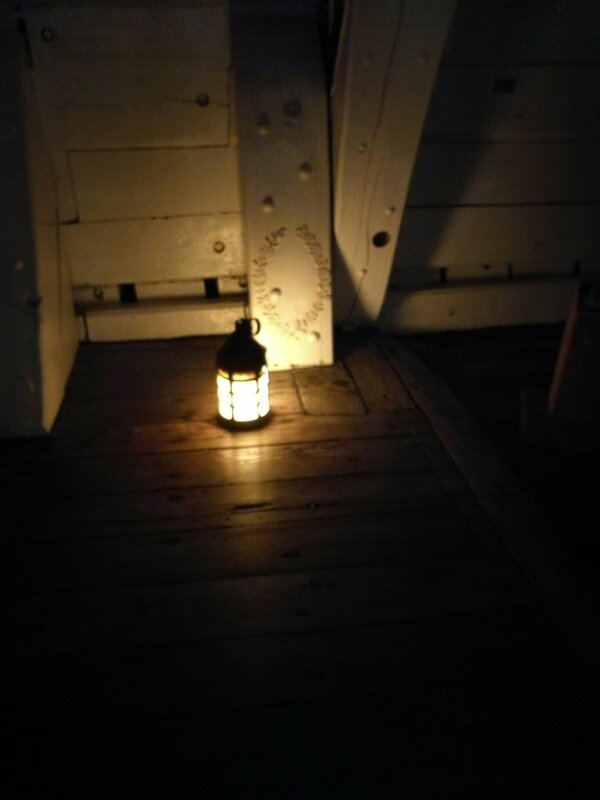 A few of the favourite pieces have been removed for sensible conservation reasons such as the famous painting of the Death of Nelson on the Orlop deck, but they hadn’t replaced this with anything other than a lantern. This was a shame as many people would just walk past the spot where he died. 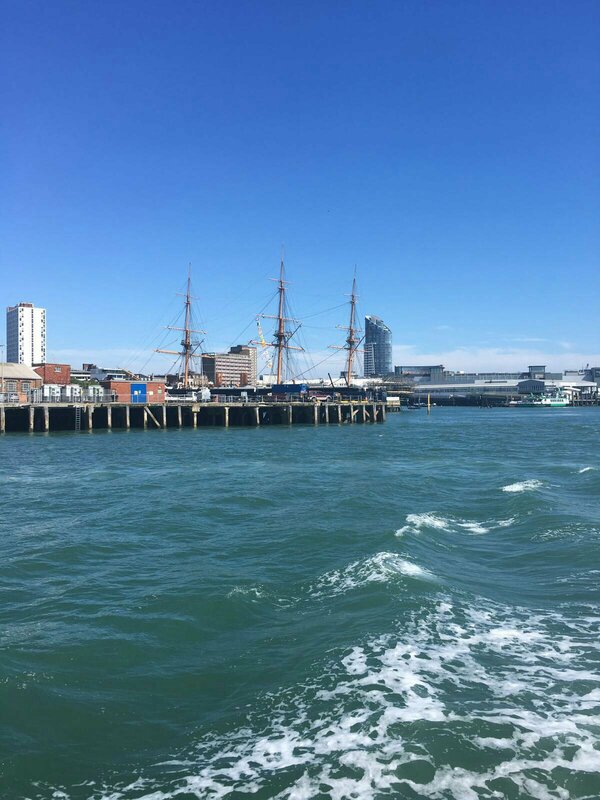 Lastly we went on the boat tour that takes you around all the naval ships currently docked there and gives you a more general history of the dockyard. I hadn’t ever done this before as it wasn’t something I was interested in but it was actually pretty informative and nice to see the dockyard from another view point. 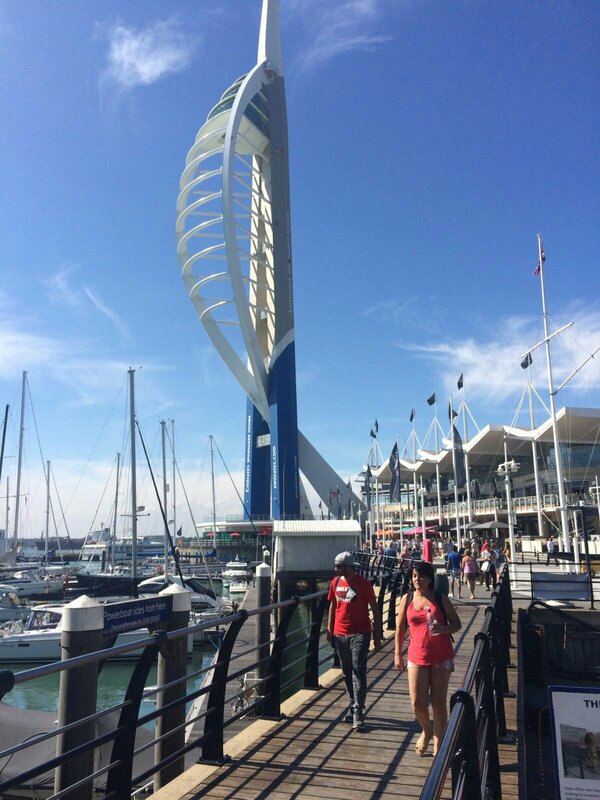 Top tip: the boat tour can also take you to the Gunwharf Quays jetty, perfect finish to your day with some delicious food and shopping at the outlet stores! 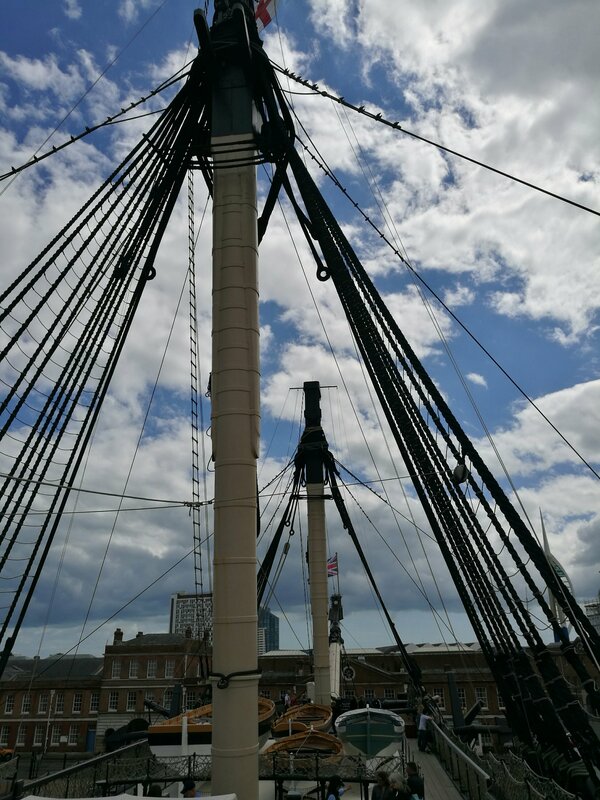 Tickets for the dockyard last for a year, although they are pricey at £35 for an adult, but you can often find discounts for this (booking online saves 20%) and naval personnel also get a discount. Naval personnel plus 4 guests can also get free entry to the NMRN and HMS Victory. The ticket also includes the M33, Explosion Museum, RN Submarine Museum and HMS Alliance in Gosport plus the waterbus service. To be honest if you want to fit everything in it would probably take you at least two visits, more if you have kids in tow!